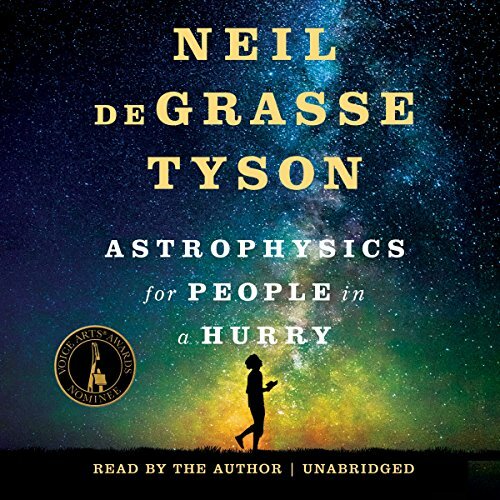 I like space science, and I like Neil deGrasse Tyson, and I got this book for free. I've watched the new Cosmos series. If you've seen Cosmos, there is no new material. Neil deGrasse Tyson discusses the stars in a way that only Neil deGrasse Tyson can. He is friendly, respectful, direct, and thoroughly enjoys the concepts he is discussing. There is an extreme lack of physics, but perhaps that is expected. After all, this is probably the shortest book reviewed on this site. The audiobook is basically an extra-long podcast episode. I concede a true review of Gravity would require several University lectures and Einstein's General Relativity is beyond hope in a book for the masses. However, the previous non-fiction book I've reviewed, I really enjoyed. I thought it managed to deliver content and concepts without math in a way I could understand. It also added a touch of urgency that made me want to continue. Neil deGrasse Tyson did well with delivering concepts, but he completely missed why I needed to listen. His reason was basically, "You should know this because the universe is cool." Yeah, it certainly is, but I like news I can use. Give me a morsel that could be meaningful within the next 50 years. His insight about the previous solar eclipse, and how that is a particularly Earthly phenomenon compared to the other planets (our moon and sun being at just the right distance from Earth to cause this occurrence is not common)... yes. That was good. More, please. Rather than lift me up, Neil deGrasse Tyson stated the book could bring me down, and that is OK. The Earth is not a unique snowflake among the billions upon billions of other likely Goldilocks-zoned planets in the billions solar systems. Neil deGrasse Tyson said that is OK. The point is to make the most of what we have. Since when were we required to be unique? We are all made of star stuff. He told a series of changing misconceptions I thought was interesting. Extending that thought process... it is possible that even our entire universe is not unique with regards to a concept called the multiverse. There is no new content in this book if you are familiar with the Cosmos series. The book can be thought of a subset of a refresher course. The book ended just when I was starting to get bored, so I suppose the size was about right. If you can find it free at the library, it is worth the 3 hours contained in it. Not more. I give it a 3/5. Discuss Astrophysics for People in a Hurry in the forums.